Decker, Oster Pro, Conair Pro: Grooming Brushes, Mane Tail Brush! • Grooming Brush Cherokee/Kelso #70: Cherokee is a white soft synthetic bristled brush with a full sized handle. The bristle is trimmed with our original double contoured trim to provide more surface contact. The handle is made with GRIP-FIT technology. Uses: Dust, Light Dirt, Loose Hair, Sheen the body, and Groom sensitive areas.Great for a head to tail brush down after a ride. 2” trim. 8½” X 2 3/8” block. #70. ORDER NOW! • Grooming Brush Long Horn Blue w/ Strap: The Long Horn is a stiff blue synthetic bristle with a large oval handle. The strap is a dark brown woven nylon. The handle is made with our Grip-Fit technology to help you get just the right grip. Works great on cattle too! Tan oval block with blue web strap. Medium stiff blue synthetic bristle. 1½” trim - 7 5/8” X 3 5/8” block. #94. ORDER NOW! • Grooming Brush Paint Choctaw #98: Paint is a horse hair blended bristled brush with a smaller handle. he handle is made with GRIP-FIT technology to help you get just the right grip. Soft horsehair blend. Great face brush. 1½ inch trim. 6¾ X 2½ inch block. #98. ORDER NOW! • Grooming Brush Pecos #61: The Pecos is a union fiber core with tampico outer outer rim bristled brush with a full size handle. The bristle is trimmed with our original double contoured trim to provide more surface contact. The handle is made with our Grip-Fit technology to give you just the right grip. Natural brown union fibre center with tampico border. 2” trim. 8½” X 2 3/8” block. #61. ORDER NOW! • Grooming Brush Sedona Red #31: The Sedona is a red synthetic bristled brush with a full size handle. The bristle is trimmed with our original double contoured trim to provide more surface contact. The handle is made with our Grip-Fit Technology to help you get the just right grip. Medium soft red. Multiple use brush. 2” trim. 8½” X 2 3/8” block. #31. ORDER NOW! • Grooming Brush Showman Natural #60: The Showman Grey is a natural grey and black English fiber bristled brush with a full size handle. The bristle is trimmed with our original double contoured trim to provide more surface contact. The handle is made with our Grip-Fit technology to give you just the right grip. USES: Shedding, Dried Mud, Caked Dirt. Firm natural grey English fiber. Just a little stiffer for the tough finishing job. 2” trim. 8½” X 2 3/8” block. #60. ORDER NOW! • Grooming Brush Thoroughbred #92: The Thoroughbred is a stiff natural union fiber bristle with a large oval handle. The strap is a dark brown woven nylon. The handle is made with our Grip-Fit technology to help you get just the right grip. Works great on show cattle too. Tan block with dark brown strap. Brown union fibre. 1 3/8” trim. 7 5/8” X 3 5/8” block. #92. ORDER NOW! • Grooming Brush Flicker Black #30: The Flicker is an extra long 3 inch black synthetic bristled brush with a full sized handle. The bristle is trimmed with our original double contour trim to provide more surface contact. The handle is made with Decker Grip-Fit technology to always provide the best grip. USES: Hair, Dust, Light Mud and moderate dirt. Black Synthetic 3" Trim Bristle. Flexible enough to use on the head but firm enough to do some real cleaning on the body. 3” trim, 8 1/2” X 2 3/8” block. #30. ORDER NOW! • Grooming Brush Buddy Natural White Small #97: Buddy is an off-white natural tampico bristled brush with a smaller handle. The handle is made with GRIP-FIT technology to help you get just the right grip. Soft natural bleached white tampico bristles. Small block for the small hand. 2” trim. 6¾” X 2½” block. #97. ORDER NOW! • Grooming Brush Pride #96: Ideal for removing mud from mane and tail. Also excellent for cattle and large pets. The bristle is trimmed with a flat trim bottom. The handle is made with our Grip-Fit technology to give you just the right grip. Tan block with brown union fibre. Packed in an attractive display box. 2” trim. 6¾” X 2½” block. #96. ORDER NOW! • Grooming Brush Work Horse #35: The Workhorse is a stiff synthetic rice root bristled brush with a full size handle. The bristle is trimmed with our original double contoured trim to provide more surface contact. The handle is made with our Grip-Fit technology to give you just the right grip. USES: Shedding, Dried Mud, Caked Dirt. Stiff synthetic rice root. Great pre-cleaning and mud brush. 2” trim. 8½” X 2 3/8” block. #35. ORDER NOW! • Grooming Brush Wild Thing #CA2005: The CA2005 has the same great feel as our #95 brush but with multicolor bristle. Each brush has two colors to match your favorite tack. Ideal size for the show ring with beautiful assorted colors. Wild Thing Brushes are designed with medium soft wavy synthetic bristles. Each brush is two colors with a 1½" trim. Measures 6¾” X 2½” block. #CA2005. ORDER NOW! • Grooming Brush Pro Body Oval #93: Pro-Body is a horse hair blended bristled brush with a large handle and hunter green strap. The handle is made with GRIP-FIT technology to help you get just the right grip. Uses: Dust, Light Dirt, Loose Hair, Sheen the body and groom sensitive areas. Tan oval block with hunter green web strap. Horse hair blend bristle 1 3/8" trim. A real Pro in all respects. #93. ORDER NOW! • Grooming Brush Ultimate #65: Ultimate is a horse hair blended bristled brush with a full size handle. The bristle is trimmed with our original double contoured trim to provide more surface contact. The handle is made with GRIP-FIT technology. Soft horse hair blend. For the extra soft touch and show ring shine. 2” trim. 8½” X 2 3/8” block. #65. ORDER NOW! • Grooming Brush Showman Natural White #50: Showman is an off-white soft natural tampico bristled brush with a full size handle. The bristle is trimmed with our original double contoured trim to provide more surface contact. The handle is made with GRIP-FIT technology. Soft natural bleached white tampico. For that extra touch in finishing. 2” trim. 8½” X 2 3/8” block. #50. ORDER NOW! • Grooming Brush The Pony Red/Blue #25: Pony is a red and blue soft synthetic bristled brush with a 2 inch trim and a smaller handle. The handle is made with GRIP-FIT Technology to help you get just the right grip. Extra soft red and blue mix. Crimped synthetic bristles. 2” trim, 6¾” X 2½” block. #25. ORDER NOW! • Grooming Brush The Pony Raspberry/White #26: Pony is a raspberry and white soft synthetic bristled brush with a smaller handle. The handle is made with GRIP-FIT technology to help you get just the right grip. Soft raspberry and white mix. Crimped synthetic bristles. 1½” trim, 6¾” X 2½” block. #26. ORDER NOW! • Grooming Brush The Pony BrushTeal/White #27: Pony is a teal and white soft synthetic bristled brush with a smaller handle. The handle is made with GRIP-FIT technology to help you get just the right grip. Soft aqua-teal white mix. Crimped synthetic bristles. 1½” trim, 6¾” X 2½” block. #27. ORDER NOW! • Grooming Brush The Pony BrushGreen/White #28: Pony is a green and white soft synthetic bristled brush with a smaller handle. The handle is made with GRIP-FIT technology to help you get just the right grip. Soft green and white mix. Crimped synthetic bristles. 1½” trim, 6¾” X 2½” block. #28. ORDER NOW! • Grooming Brush Blue Ribbon Brush #95: The Blue Ribbon is medium stiff synthetic bristled brush with a smaller handle. The handle is made with GRIP-FIT technology to provide you get just the perfect grip. USES: Hair, Dust, Light Mud amd moderate dirt. #95. ORDER NOW! *** Your color selection is based on availabilty at the time of purchase. 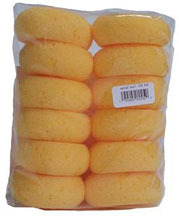 • Tack Sponge 12/Pack #14DTS:Tack Sponge is the smallest sponge, it is perfect for cleaning and polishing leather goods. it is the perfect size for use on small tack products and boot too! the 14DTS is made from hadera material, it is the most absorbent material next to a real sponge. 12/Pack. #14DTS. ORDER NOW! • Stiff Grooming Brush BLUE: This durable body brush with stiff bristles is just what you need to remove the mud, sweat and dirt from your horses’ coat. The comfortable handle makes your job even easier. Features ergonomic design with comfort grip handle that easily fits man/woman's hand. Densely packed stiff bristles to remove dirt from your horses' coats. #78399-100-001. ORDER NOW! • Stiff Grooming Brush PINK: Remove mud, sweat and dirt from your horses’ coat with this fashionable pink durable body brush, specially designed with an easy to grip handle. 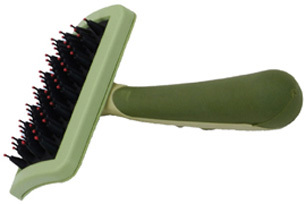 Durable body brush with stiff bristles to get mud, sweat and dirt from your horses' coats. #78399-101-001. ORDER NOW! • Hair Finishing Brush MEDIUM BLUE: A comfortable groom and high shine for your horse are the order of the day with this natural, medium bristles, round face brush. The brush’s unique, comfort grip handle makes your job simpler as well. Natural, medium bristles give your horse a comfortable groom and high shine Round face brush for sensitive and small areas. #78399-230-001. ORDER NOW! Mane & Tail Brush: No more broken or pulled out hair with this gentle pink mane and tail brush. A specially designed comfort handle and round face lets you brush your horse’s mane and tail with ease. Comfort handle and round face allow you to brush the mane and tail with ease. Doesn't break or pull out hair. • Mane & Tail Brush: Blue. #78399-140. ORDER NOW! • Mane & Tail Brush: Pink. #78399-141. ORDER NOW! • Soft Grooming Brush Blue: You'll pick up this sturdy, easy to handle brush with soothing, natural soft bristles again and again. Wonderful for bringing out your horses' natural oils for a shiny, healthy looking coat. Soft, natural hog hair bristles. Natural bristles bring out the coat's natural oils for superior shine. Blue. #78399-110. ORDER NOW! • Firm Slicker Brush for Dogs SMALL: Perfect for medium, long and curly coats to eliminate surface mats and tangles without damaging the coat. Made with straight bristles on one side and bent bristles on the other side. Dual flex head design traces the natural contours of your dog's body, and keeps the bristles in their best working position. Ergonomic handle is secure and comfortable in your hand. Small. #104007. ORDER NOW! Slicker Brush Soft Pin: GripSoft Slicker Brush with Soft Pins is perfect for everyday brushing for pets with delicate skin. This brush has a rounded head and slightly angled soft pins. The soft pins are gentle, but efficient to help stop matting and to eliminate dead and shedding fur. The JW non-slip ergonomically designed handle is also more comfortable on the hand making grooming a more enjoyable experience for you. • Slicker Brush Soft Pin REGULAR #65002: Perfect for regular brushing of pets with sensitive skin. Measures 10 x 2.8 x 5.5 inches. Regular. #65002. ORDER NOW! • Slicker Brush Soft Pin SMALL #65011: Grip Soft Small Slicker Brush with Soft Pins is an all-purpose brush is designed for smaller to mid-size breeds with sensitive skin. For regular grooming between baths use Small Slicker Brush everyday for long coated breeds and every few days for breeds with short coats. Measures 9.8 X 5 X 2.8 inches. Small. #65011. ORDER NOW! Slicker Self Cleaning Brush: GripSoft Self-Cleaning Slicker Brush grooms and cleans up with the touch of a button! Specially designed “ribs" prevent pins from becoming bent when retracting for cleaning. Rounded head permits for grooming in hard to reach areas. Self-Cleaning Slicker Brush is perfect for removing excess and shedding hair. The GripSoft ergonomic over-molded handle makes grooming more comfortable for the pet parent. • Slicker Self Cleaning Brush CAT #65060: Cat. Measures 9.8 X 5 X 2.8 inches. #65060. ORDER NOW! • Slicker Self Cleaning Brush SMALL #65059: Small. Measures 9.8 X 5 X 2.8 inches. #65059. ORDER NOW! • Slicker Self Cleaning Brush LARGE #65058: Large. Measures 10 x 5.5 x 2.8 inches.#65058. ORDER NOW! Consistent grooming of your dog's coat will keep it clean and healthy, and time spent grooming improves the bond between you and your dog. • Safari Complete Dog Brush LONGHAIR #W423: Safari Complete Dog Brush is designed as a firm smoother and bristle brush especially for longhaired dogs. Made with the nylon coated tips to eliminate extra undercoat, tangles and loose hair for a healthy coat and home. The rubber fingers smooth, condition and shine the coat. Perfect for everyday use. #W423. ORDER NOW! • Safari Dog Brush Nylon Coated Tip SHORTHAIR #W422: Safari Nylon Coated Tip Dog Brush offers a firm slicker and bristle brush specifically for shorthaired dogs. Made with rubber pins to penetrate deep in to the coat to remove loose hair and undercoat. The special tips on the rubber pins gently massage the skin to dispense natural oils, generating a healthy, shiny coat. Perfect tool to help reduce shedding for a healthy coat and home. #W422. ORDER NOW! • Ultimate Touch Combo Pet Grooming Brush LARGE #11662: Ultimate Touch Combo Pet Grooming Brush permits you to maintain your pet looking well-defined and tidily brushed. Eliminates dead, unwanted hair with mats and tangles. Made with reinforced wire and nylon bristles; and durable grip adds comfort and control when brushing. Meausres 3.75 L x 4 W x 12.25 H inches. #11662. ORDER NOW!